When one hosts a month of Mixology Monday, I think there is a knee-jerk reaction to do as much as you can. You’re the host; you need to show off a little bit, right? But dammit if I didn’t think ahead a bit more and pump out all the other ideas I had. There is a smoker sitting on my porch right now, unused since two Thanksgivings ago when we smoked a turkey. I’m OK with that though. For this third and last post, I still got a hell of a lot of smoke into this drink. And my kitchen. And my clothes. Lots of delicious, rosemary infused smoke. Last month, the company that does the PR for the Black Grouse invited me out to try their product at two Los Angeles bars where the bartenders would be showcasing the way they would serve this Scotch Whisky. They also generously provided me with my own bottle that I am using here. 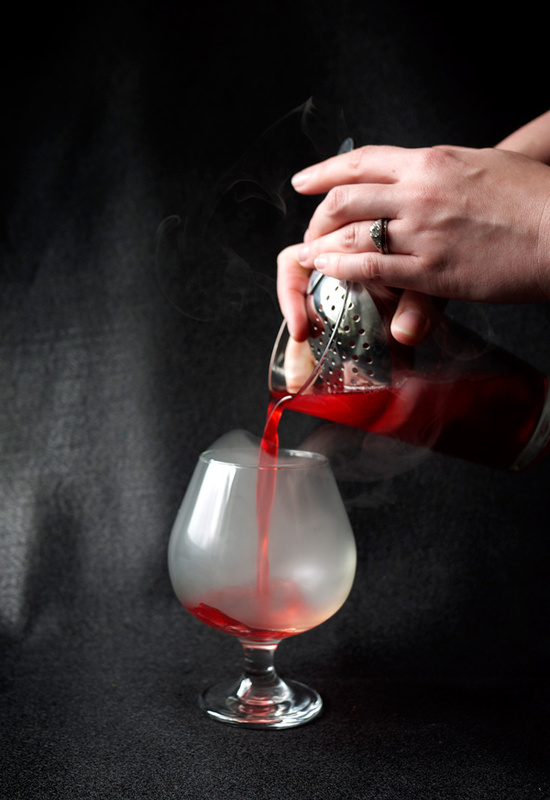 At the first bar, Sassafras, I learned that you can smoke rosemary for a drink using only a tea candle and a snifter glass. The simplicity and genius of this bar trick stayed with me. I knew at some point I would have to try this, and this month was the perfect opportunity to do so. Here’s the thing about smoking herbs: use organic, and if possible, from your own garden (that’s where mine came from). Not sure if your grocery store has organic you can trust? Go to a farmer’s market and ask the person selling the herbs if they use pesticides or chemicals on their herbs. Why go through all the trouble? Because crap in crap out. 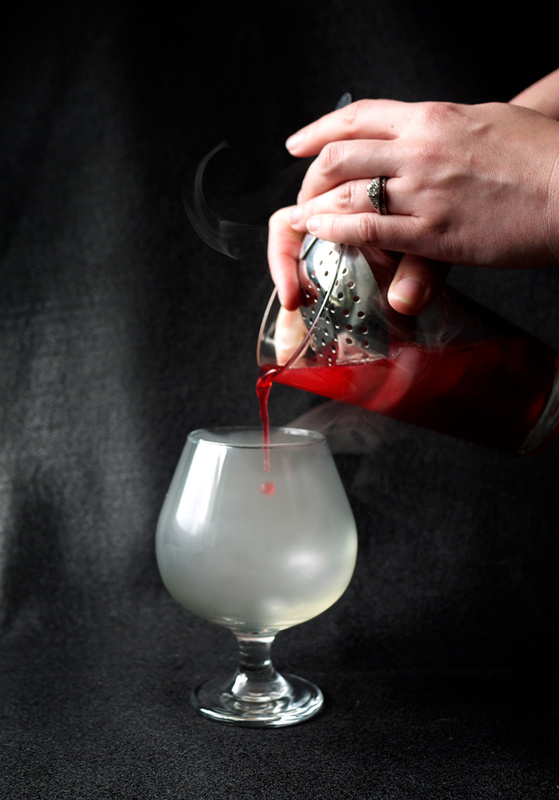 The smoke from this drink will be IN your drink and you are going to ingest it. Do you want weird unknown substances being brought to high temperatures and those fumes entering your mouth? You don’t care? You like huffing sharpies? Fine, you’ve been warned. The blackberries here in Southern California are starting to go tart, so for this cocktail, I wanted to use them up in a syrup, as they would not give enough sweetness just muddling them into the drink. FYI, this syrup is super thick. If you’re not sure what to do with the leftover syrup, there is only one way to go: PANCAKES. IMPORTANT: get everything ready before you begin, this will move fast. Light the tea candle and place the rosemary across the top on the jam jar/candle holder. This will take a minute to warm up and start smoking. It’s best if your rosemary has not dried completely from cleaning (not wet, but not bone dry). In a shaker filled 2/3 with ice, add the first four ingredients and shake well until chilled. Set aside. 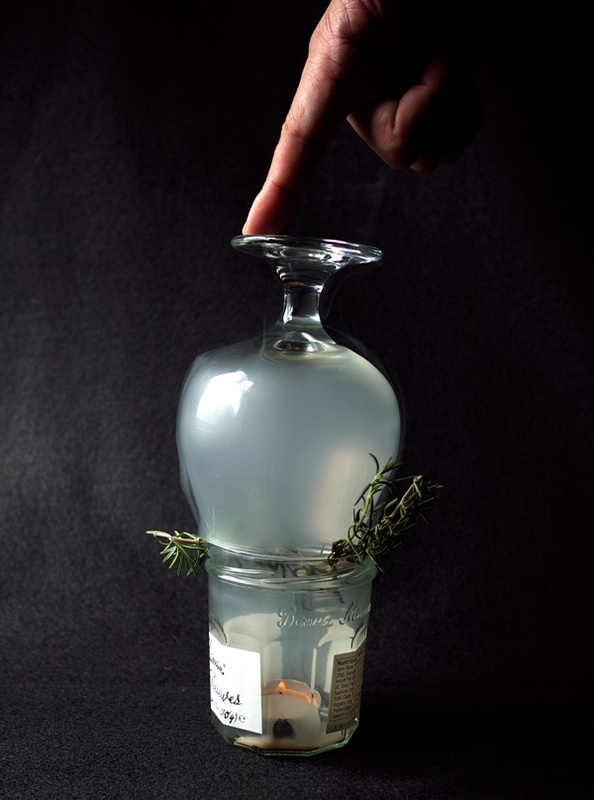 Once the rosemary starts to smoke, place a snifter glass over the top so that the smoke fills the glass completely. 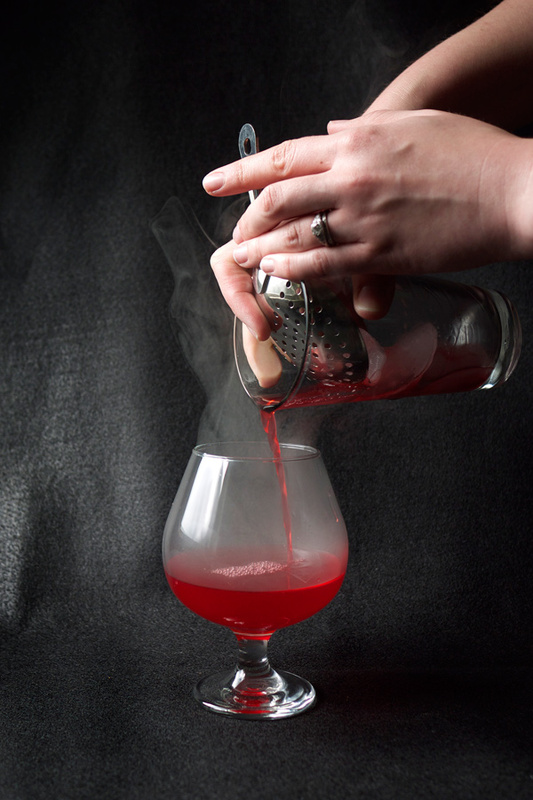 Using the card stock, slide it over the top of the glass to “hold” the smoke inside until you pour your drink in. Remove the rosemary from the candle. When you are ready, quickly remove the card stock and strain the contents of the shaker into the glass. Woodsy, rosemary tinged smoke fills the glass. Those notes infuse through the lightly sweetened berry flavor with tart background highlights. The Black Grouse is mellowed out and given an almost honey quality, while also heightening the smoky flavor. Even when you no longer can see the smoke, it stays with the drink from first to last sip. On the celery bitters: these you CANNOT leave out. You will not taste celery, but what they do is provide an amazing amount of balance. Without them, the drink is both too sharply tart and too sweet. A few drops and it balances everything out. Kinda amazing how bitters do that. I dont have a blended scotch bottle in my armory. I’ve tasted this one but I dont really have much to compare it against that isnt Canadian blended whiskey. Which one of their line would you recommend for mixing (I’m not really into sipping it straight)? oh yeah, LOVING that black/silver/reg/smoke composition you have going on! I think that julep strainer needed another 2 hands on it tho lol Like that scene from ghost with the clay pot. As the household “man hands”, I got called in to operate the camera shutter… so was unable to get in on “Ghost”-style julep-straining action. Am proud to say tho, that’s my finger holding down the glass in candle shot. 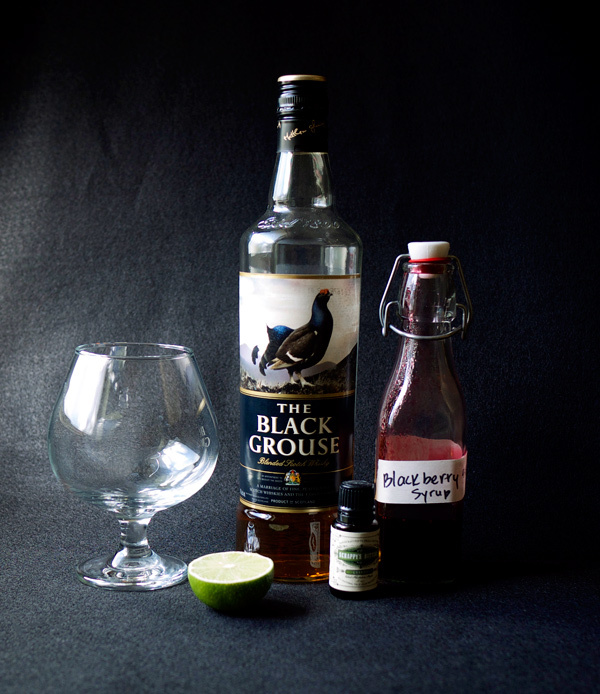 The Black Grouse has worked really well in mixed drinks. The first time I had it I tasted it, I had it by itself, and then in like, 6 different cocktails. And thanks, I’ve been digging the moody compositions lately. Hi Elana, didn’t knew about your blog until this last MxMo. Good cocktails and amazing pics! Thanks for hosting, it’s a shame I couldn’t participate. Because what finishes up a night of drinking like pancakes?!?! Right? Right??? I just had my first smoked drink a couple weeks ago, and thanks to your generosity with your tea light and snifter wisdom, am now quite anxious to try out this little ditty. It’s so easy, you need to try it. And then make some pancakes. Because pancakes are also awesome.